Real talk with the artist-activists who hijacked Victoria's Secret's identity to create a conversation about sexual consent. Plus, all about their moving new project The Monument Quilt. On the morning after #OscarsSoWhite, we’re feeling inspired to share a powerful little film with a big message—made right here in Baltimore. Here’s why “A Dream Preferred” gets our nod for the most inspiring movie we saw in 2015. Lessons from #GivingTuesday on building powerful social movements. As we ring in 2016, we find ourselves dreaming (and strategizing) about how to make big change in the new year—and reflecting on what we’ve learned about changemakers and movement building over the last 12 months. The intersection of civic activism and technology is fueling movements that are redefining our world, from business (think Uber and AirBnB) to social impact (like Global Citizen and Occupy). In the social sector, these movements give people power, helping them to recognize that they matter—and that, together, they matter more. They are a window into how true citizen engagement can create large-scale change at a speed that was not possible even five years ago. And, in 2015, we saw several examples of these movements growing in strength, breadth and impact with #BlackLivesMatter, and the Ice Bucket Challenge. I first became engaged in movement-building as a citizen participant on #GivingTuesday in 2012. Like thousands of other people, I discovered the now-global campaign via social media— following the “giving” threads on Twitter, which was an everyday task for me as the founder of GiveCorps, a crowdfunding startup for nonprofits. At the time, I had no idea what a profound impact those few simple Tweets would have on my life and career, ultimately inspiring my passion to launch Generosity and work on movement-building full time. I felt there was something compelling and different about what the #GivingTuesday folks were cooking up in New York City...and I jumped in. 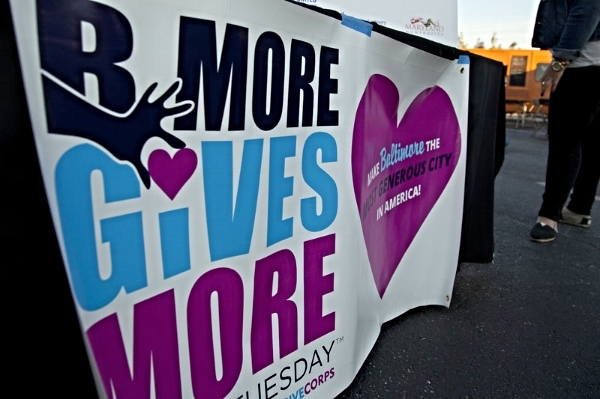 My colleagues and I were shocked by the response to GiveCorps’ low-key, two-week campaign in 2012, so we decided to go big in 2013—launching a city-wide #BmoreGivesMore campaign with the goal of coalescing our community around something even more ambitious than raising funds for individual nonprofits. We saw #GivingTuesday as a chance to lay claim—in a very public way—to a different identity for Baltimore. And It worked! Thousands of citizens and hundreds of merchants, nonprofits and philanthropic partners teamed up to raise $5.7 million in 24 hours, making Baltimore the “Most Generous City in America” on #GT 2013. #BMoreGivesMore is just one of many experiments that have bubbled up in the #GivingTuesday learning lab, and its founding principles and results continue to transform the way we think about philanthropy and social movements. Here are some of the key takeaways for building movements of all kinds. People Want to Be Generous. During the height of the consumer season, #GivingTuesday invites Americans to consider what “giving” really means—inspiring us to care more about doing good than looking good. But guess what? The same message now resonates in 70+ countries—and most of them don’t even have Black Friday or Cyber Monday. By our very nature, human beings want to matter, and this resonates year-round, in every language. Everyone Counts. The cumulative power of giving—whether $5 or $5 billion, from a 15-year-old or a 55-year-old—is what makes change happen. The most successful movements intentionally invite and celebrate engagement by Bill Smith and Bill Gates. There Are Many Ways To Give. I’ll never forget a call that came in during the #BmoreGivesMore campaign from a woman who said she was on a fixed income but had a beautiful piano she could donate. We helped her find a children’s music nonprofit that was thrilled to accept it. Movements celebrate giving and engagement in all forms: money, time, activism/advocacy and just random acts of goodness. Giving is Cool—and Poised to Grow. Millennials are the biggest generation in history and they’re civic-minded, generous and just reaching their earning years. They thrive on social engagement and peer validation. They have the potential to give more than prior generations, but they will give their way—on digital, mobile platforms, to organizations that show them their impact. #GivingTuesday is a movement that is reaching them: data shows that 38% of U.S. millennials planned to participate on #GivingTuesday this year, up from just 8% last year! Don’t Be A Control Freak. During my team’s first call with the #GivingTuesday founders at the 92nd Street Y in New York, we were nervous to tell them we had made up our own name, logo, hashtag and website for the #BmoreGivesMore campaign. Turns out, they loved it! Henry Timms and Asha Curran designed #GivingTuesday to be an “open-source” experiment in generosity, so they have never felt the need to own the movement, control the brand or make rules for participation—a mentality that makes it so successful. Get Creative. #GivingTuesday fosters authenticity and creativity by encouraging participants to innovate. Take for example Hub Group, a transportation company that painted four of its 53-foot freight train containers to serve as "mobile billboards" for different charities his year. When people spotted the #CauseContainers traversing North America, they were encouraged to “snap, tag and post” to social media, which could earn up to $100 per photo for a children’s hospital, a no-kill animal shelter and other causes the company and its employees care about. The campaign raised more than $8,500 this year and much more in terms of the visibility these mobile billboards provided to the featured nonprofits. Don't Sell Out. The only thing the #GivingTuesday founders are absolutely unwavering about? Refusing to let the brand be co-opted by a corporation (or any other entity) for goals that are not in the spirit of the movement. Even in the social sector, organizations sometimes become so large and powerful that they lose sight of the greater good and actively work to dominate or even exclude other organizations dedicated to the same cause. Stay true to the ultimate goal of growing support, activation and giving, and there’s enough “pie” to go around. Share the Wealth. The #GivingTuesday team at 92nd Street Y—located, by the way, in the middle of a 140-year-old community center with its own operating budget and fundraising goals—is tiny. Four people in a tight office propel this global movement. Each year, the staff collects the data surrounding #GivingTuesday and uses it to shine a light on all the best mini-movements around the globe. In this way, a cool project in Atlanta can help improve one in Altoona or Albuquerque or even Africa or Asia. #GivingTuesday is truly the 92nd Street Y’s gift to the world—and a beautiful act of altruism unto itself. SO TELL US... What was the social movement that inspired you most in 2015? Jamie McDonald was interviewed recently by CityBizList about entrepreneurship, Baltimore, family, and generosity. This is part one of a two part interview where Jamie shares her thoughts. We'd welcome your feedback or reactions. Millennials on a Mission: Idealism, Impact, Innovation. If you are a business or nonprofit leader, why should you focus on Millennials, whose resources are small relative to their older counterparts? Further, the strategies for engaging Millennials are no longer just preferences. They have become the norm for effective communication with all ages. Generosity. The Subscription Economy. And the Future of Fundraising. Inspire them once. Get them giving forever. The most important supporters of any nonprofit are the committed donors that give each year. Today, most repeat donors are acquired in an expensive process of online and offline stewardship, involving periodic communications and cultivation, followed by an annual ask. And every year, 40-50% of these past donors fall away. Technology is enabling nonprofits to reverse this dynamic with subscription giving: to focus on celebrating, thanking and sharing impact with a donor whose gift is in hand every month. Subscription – sometime called recurring or monthly - donors have to find reasons not to give, and must actively take steps to stop being generous. This goes against one's basic instincts, and results in long-term retention of subscription givers.